One of the most fundamental tasks of modern astrophysics is the study of the evolution of the Universe . This is a daunting undertaking that requires extensive observations of large samples of objects in order to produce reasonably detailed maps of the distribution of galaxies in the Universe and to perform statistical analysis. Much effort is now being put into mapping the relatively nearby space and thereby to learn how the Universe looks today . But to study its evolution, we must compare this with how it looked when it still was young . This is possible, because astronomers can "look back in time" by studying remote objects - the larger their distance, the longer the light we now observe has been underway to us, and the longer is thus the corresponding "look-back time." This may sound easy, but it is not. Very distant objects are very dim and can only be observed with large telescopes. Looking at one object at a time would make such a study extremely time-consuming and, in practical terms, impossible. To do it anyhow, we need the largest possible telescope with a highly specialised, exceedingly sensitive instrument that is able to observe a very large number of (faint) objects in the remote universe simultaneously. The VLT VIsible Multi-Object Spectrograph (VIMOS) is such an instrument. It can obtain many hundreds of spectra of individual galaxies in the shortest possible time; in fact, in one special observing mode, up to 6400 spectra of the galaxies in a remote cluster during a single exposure, augmenting the data gathering power of the telescope by the same proportion. This marvellous science machine has just been installed at the 8.2-m MELIPAL telescope, the third unit of the Very Large Telescope (VLT) at the ESO Paranal Observatory. A main task will be to carry out 3-dimensional mapping of the distant Universe from which we can learn its large-scale structure. "First light" was achieved on February 26, 2002, and a first series of test observations has successfully demonstrated the huge potential of this amazing facility. Much work on VIMOS is still ahead during the coming months in order to put into full operation and fine-tune the most efficient "galaxy cruncher" in the world. VIMOS is the outcome of a fruitful collaboration between ESO and several research institutes in France and Italy, under the responsibility of the Laboratoire d'Astrophysique de Marseille (CNRS, France). The other partners in the "VIRMOS Consortium" are the Laboratoire d'Astrophysique de Toulouse, Observatoire Midi-Pyrénées, and Observatoire de Haute-Provence in France, and Istituto di Radioastronomia (Bologna), Istituto di Fisica Cosmica e Tecnologie Relative (Milano), Osservatorio Astronomico di Bologna, Osservatorio Astronomico di Brera (Milano) and Osservatorio Astronomico di Capodimonte (Naples) in Italy. The next in the long series of front-line instruments to be installed on the ESO Very Large Telescope (VLT), VIMOS (and its complementary, infrared-sensitive counterpart NIRMOS, now in the design stage) will allow mapping of the distribution of galaxies, clusters, and quasars during a time interval spanning more than 90% of the age of the universe. It will let us look back in time to a moment only ~1.5 billion years after the Big Bang (corresponding to a redshift of about 5). Like archaeologists, astronomers can then dig deep into those early ages when the first building blocks of galaxies were still in the process of formation. 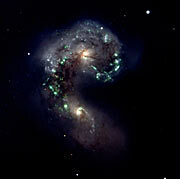 They will be able to determine when most of the star formation occurred in the universe and how it evolved with time. 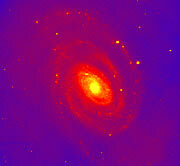 They will analyse how the galaxies cluster in space, and how this distribution varies with time. Such observations will put important constraints on evolution models, in particular on the average density of matter in the Universe. Mapping the distant universe requires to determine the distances of the enormous numbers of remote galaxies seen in deep pictures of the sky, adding depth - the third, indispensible dimension - to the photo. VIMOS offers this capability, and very efficiently. Multi-object spectroscopy is a technique by which many objects are observed simultaneously. VIMOS can observe the spectra of about 1000 galaxies in one exposure, from which redshifts, hence distances, can be measured . The possibility to observe two galaxies at once would be equivalent to having a telescope twice the size of a VLT Unit Telescope. VIMOS thus effectively "increases" the size of the VLT hundreds of times. From these spectra, the stellar and gaseous content and internal velocities of galaxies can be infered, forming the base for detailed physical studies. At present the distances of only a few thousand galaxies and quasars have been measured in the distant universe. VIMOS aims at observing 100 times more, over one hundred thousand of those remote objects. This will form a solid base for unprecedented and detailed statistical studies of the population of galaxies and quasars in the very early universe. 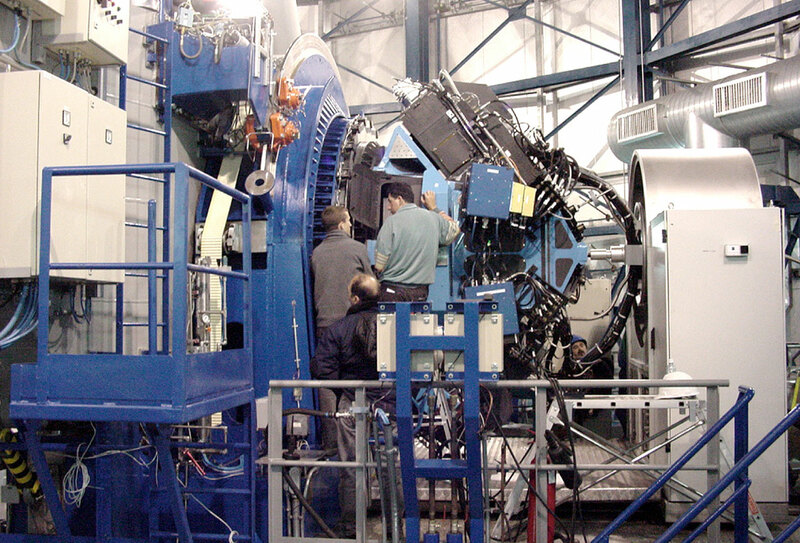 VIMOS is installed on the Nasmyth "Focus B" platform of the 8.2-m VLT MELIPAL telescope, cf. ESO Press Photo eso0209 . It may be compared to four multi-mode instruments of the FORS-type, joined in one stiff structure. The construction of VIMOS has involved the production of large and complex optical elements and their integration in more than 30 remotely controlled, finely moving functions in the instrument. In the configuration employed for the "first light", VIMOS made use of two of its four channels. The two others will be put into operation in the next commissioning period during the coming months. 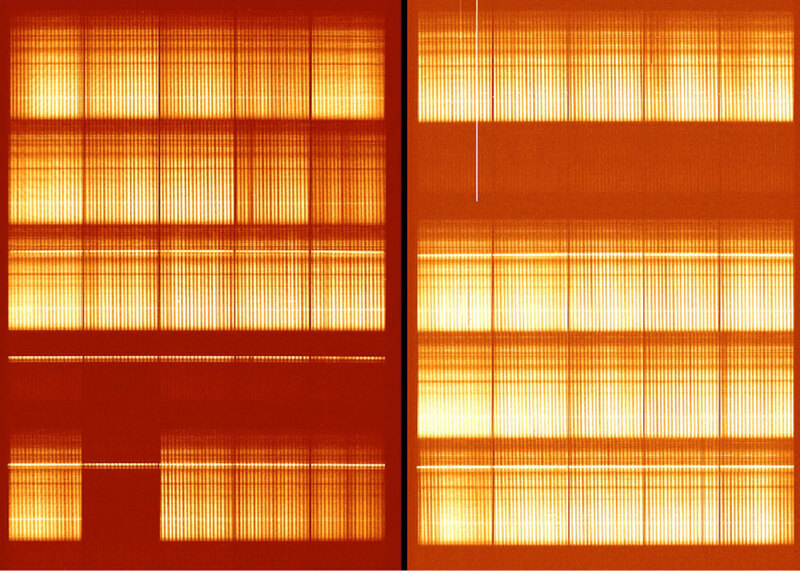 However, VIMOS is already now the most efficient multi-object spectrograph in the world, with an equivalent (accumulated) slit length of up to 70 arcmin on the sky. 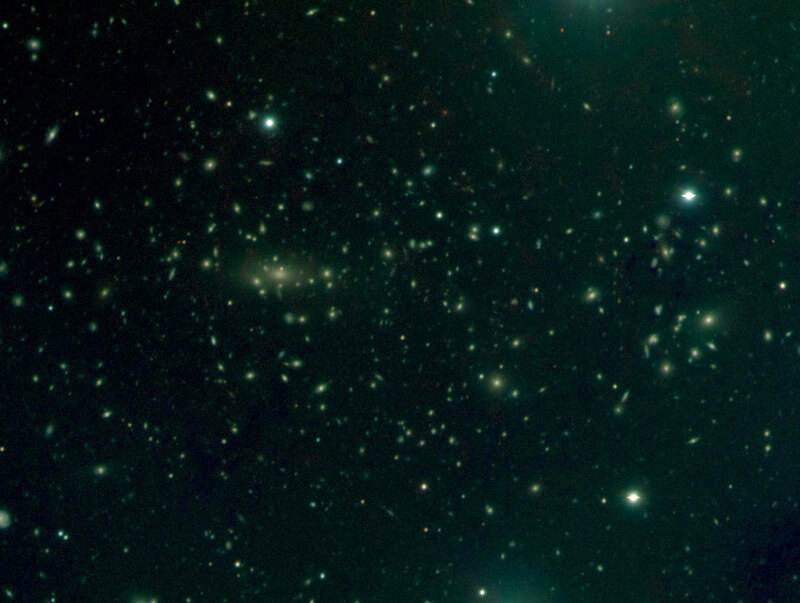 VIMOS has a field-of-view as large as half of the full moon (14 x 16 arcmin 2 for the four quadrants), the largest sky field to be imaged so far by the VLT. It has excellent sensitivity in the blue region of the spectrum (about 60% more efficient than any other similar instruments in the ultraviolet band), and it is also very sensitive in all other visible spectral regions, all the way to the red limit. But the absolutely unique feature of VIMOS is its capability to take large numbers of spectra simultaneously, leading to exceedingly efficient use of the observing time. 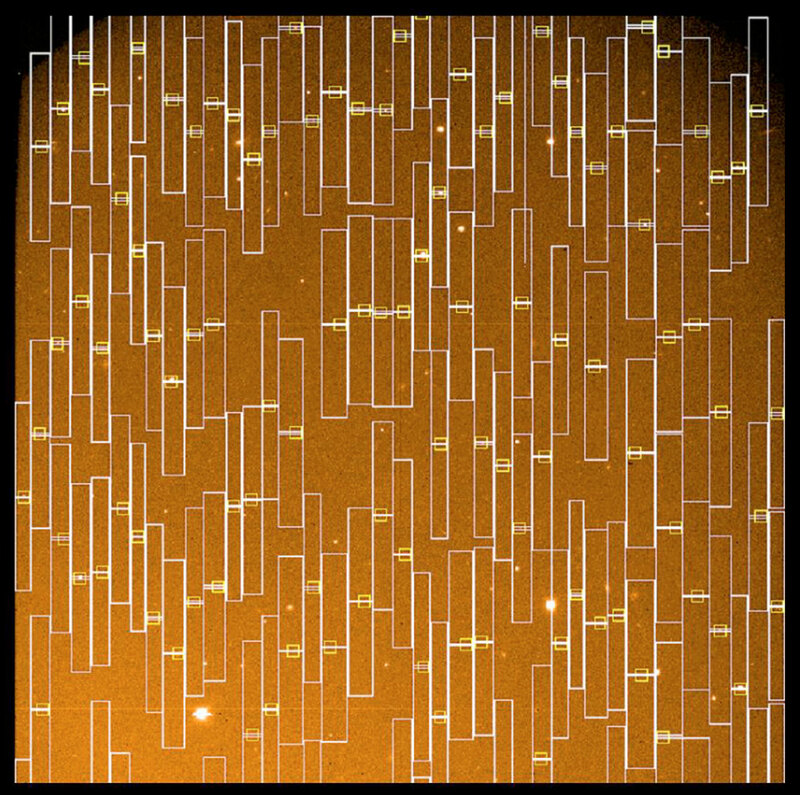 Up to about 1000 objects can be observed in a single exposure in multi-slit mode. 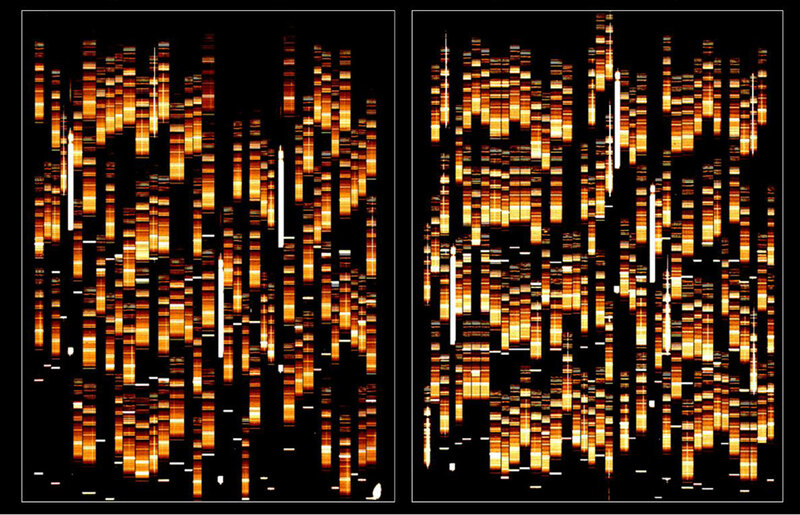 And no less than 6400 spectra can be recorded with the Integral Field Unit, in which a closely packed fibre optics bundle can simultaneously observe a continuous sky area measuring no less than 56 x 56 arcsec 2. A dedicated machine, the Mask Manufacturing Unit (MMU), cuts the slits for the entrance apertures of the spectrograph. The laser is capable of cutting 200 slits in less than 15 minutes. This facility was put into operation at Paranal by the VIRMOS Consortium already in August 2000 and has since been extensively used for observations with the FORS2 instrument; more details are available in eso9919. VIMOS was shipped from Observatoire de Haute-Provence (France) at the end of 2001, and reassembled at Paranal during a first period in January 2002. From mid-February, the instrument was made ready for installation on the VLT MELIPAL telescope; this happened on February 24, 2002. VIMOS saw "First Light" just two days later, on February 26, 2000, cf. ESO Press Photo eso0209 . 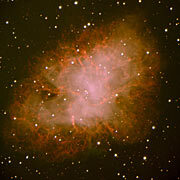 During the same night, a number of excellent images were obtained of various objects, demonstrating the fine capabilities of the instrument in the "direct imaging"-mode. The first spectra were successfully taken during the night of March 2 - 3, 2002 . The slit masks that were used on this occasion were prepared with dedicated software that also optimizes the object selection, cf. ESO Press Photo eso0209, and were then cut with the laser machine. From the first try on, the masks have been well aligned on the sky objects. 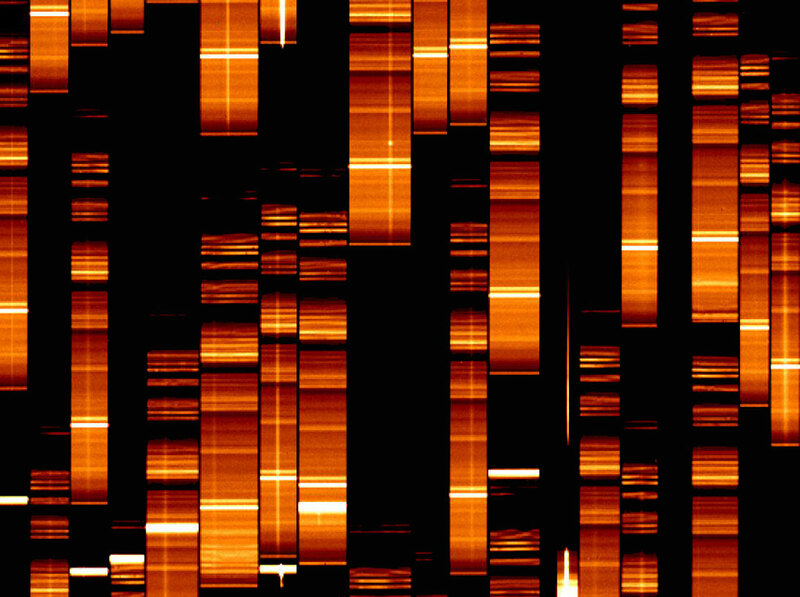 The first observations with large numbers of spectra were obtained shortly thereafter. 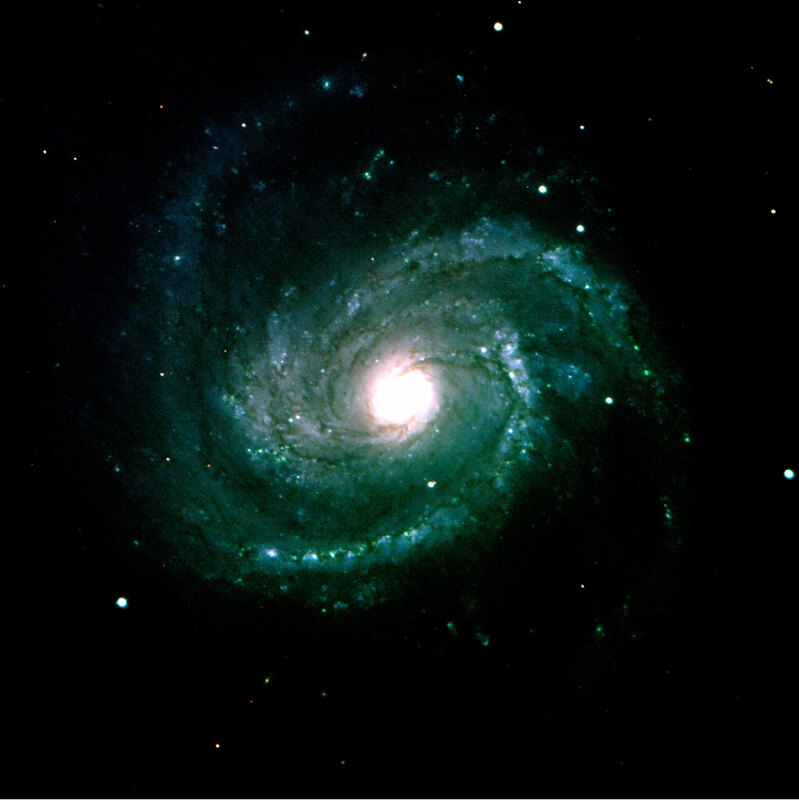 Images of nearby galaxies, clusters of galaxies, and distant galaxy fields were among the first to be obtained, using the VIMOS imaging mode and demonstrating the excellent efficiency of the instrument, various examples are shown below. 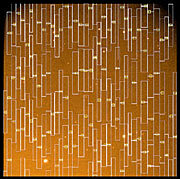 The first observations of multi-spectra were performed in a selected sky field in which many faint galaxies are present; it is known as the "VIRMOS-VLT Deep Survey Field at 1000+02". Thanks to the excellent sensitivity of VIMOS, the spectra of galaxies as faint as (red) magnitude R = 23 (i.e. over 6 million times fainter than what can be perceived with the unaided eye) are visible on exposures lasting only 15 minutes. Some of the first observations with the Integral Field Unit were made of the core of the famous Antennae Galaxies (NGC 4038/39) . They will form the basis for a detailed map of the strong emission produced by the current, dramatic collision of the two galaxies. This is a joint Press Release of ESO, Centre National de la Recherche Scientifique (CNRS) in France, and Consiglio Nazionale delle Ricerche (CNR) and Istituto Nazionale di Astrofisica (INAF) in Italy. In astronomy, the redshift denotes the fraction by which the lines in the spectrum of an object are shifted towards longer wavelengths. The observed redshift of a distant galaxy gives a direct estimate of the apparent recession velocity as caused by the universal expansion. Since the expansion rate increases with distance, the velocity is itself a function (the Hubble relation) of the distance to the object. ESO Press Photo eso0209a : Composite VRI image of NGC 4038/39, obtained on 26 February 2002, in a bright sky (full moon). Individual exposures of 60 sec each; image quality 0.6 arcsec FWHM; the field measures 3.5 x 3.5 arcmin 2. North is up and East is left. 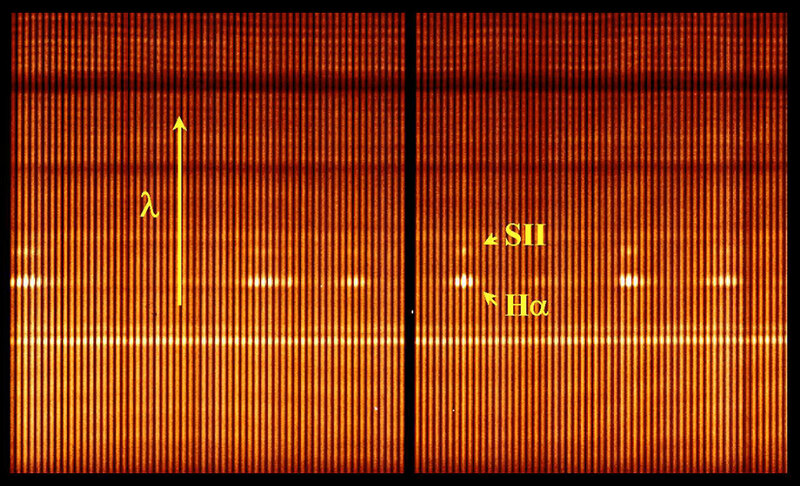 ESO Press Photo eso0209b : MOS-spectra obtained with two quadrants totalling 221 slits + 6 reference objects (stars placed in square holes to ensure a correct alignment). Exposure time 15 min; LR(red) grism. This is the raw (unprocessed) image of the spectra. ESO Press Photo eso0209e : A 60 sec i exposure of NGC 5364 on February 26, 2002; image quality 0.6 arcsec FWHM; full moon; 3.5 x 3.5 arcmin 2 ; North is up and East is left. 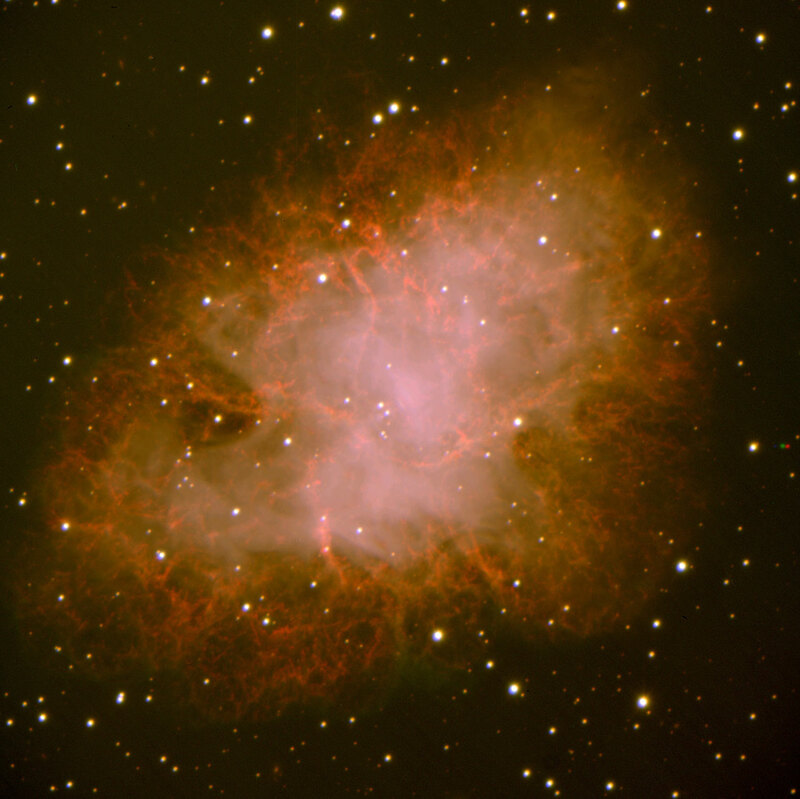 ESO Press Photo eso0209f : Composite VRI image of Messier 1, obtained on March 4, 2002. The individual exposures lasted 180 sec; image quality 0.7 arcsec FWHM; field 7 x 7 arcmin 2 ; North is up and East is left. 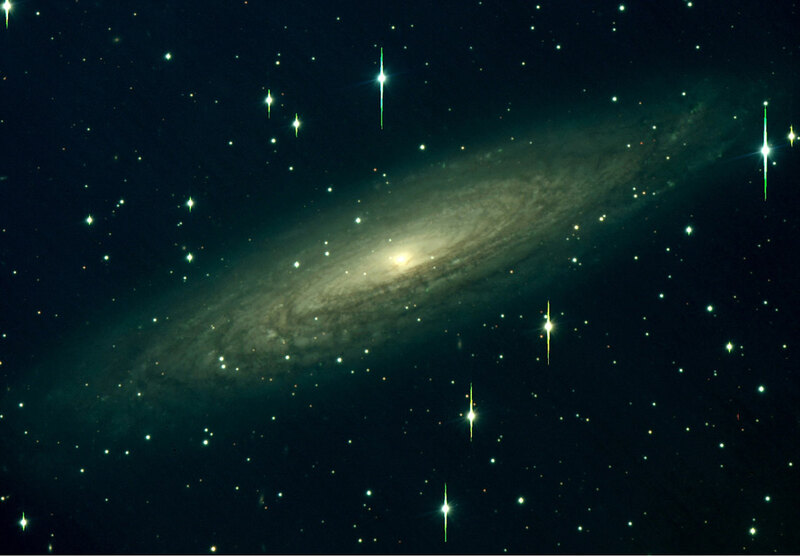 ESO Press Photo eso0209g : Composite VRI image of NGC 2613, obtained on February 28, 2002. The individual exposures lasted 180 sec; image quality 0.7 arcsec FWHM; field 7 x 7 arcmin 2 ; North is up and East is left. ESO Press Photo eso0209h : Composite VRI image of Messier 100, obtained on March 3, 2002. The individual exposures lasted 180 sec, image quality 0.7 arcsec FWHM; field 7 x 7 arcmin 2 ; North is up and East is left. 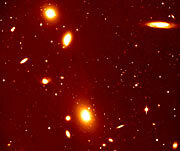 ESO Press Photo eso0209i : R-band image of galaxy cluster ACO 3341, obtained on March 4, 2002. Exposure 300 sec, image quality 0.5 arcsec FWHM;. field 7 x 7 arcmin 2 ; North is up and East is left. ESO Press Photo eso0209j : Composite VRI image of the distant cluster of galaxies MS 1008.1-1224. The individual exposures lasted 300 sec; image quality 0.8 arcsec FWHM; field 5 x 3 arcmin 2 ; North is to the right and East is up. ESO Press Photo eso0209k : Mask design made with the VMMPS tool, overlaying a pre-image. The selected objects are seen at the centre of the yellow squares, where a 1 arcsec slit is cut along the spatial X-axis. The rectangles in white represent the dispersion in wavelength of the spectra along the Y-axis. Masks are cut with the Mask Manufacturing Unit (MMU) built by the Virmos Consortium. ESO Press Photo eso0209l : Enlargement of a small area of ESO Press Photo eso0209b. ESO Press Photo eso0209m : Spectra of the central area of NGC 4038/39, obtained with the Integral Field Unit on February 26, 2002. The exposure lasted 5 min and was made with the low resolution red grating. ESO Press Photo eso0209n : Zoom-in on small area of ESO Press Photo eso0209b. The strong emission lines of hydrogen (H-alpha) and ionized sulphur (S II) are seen.